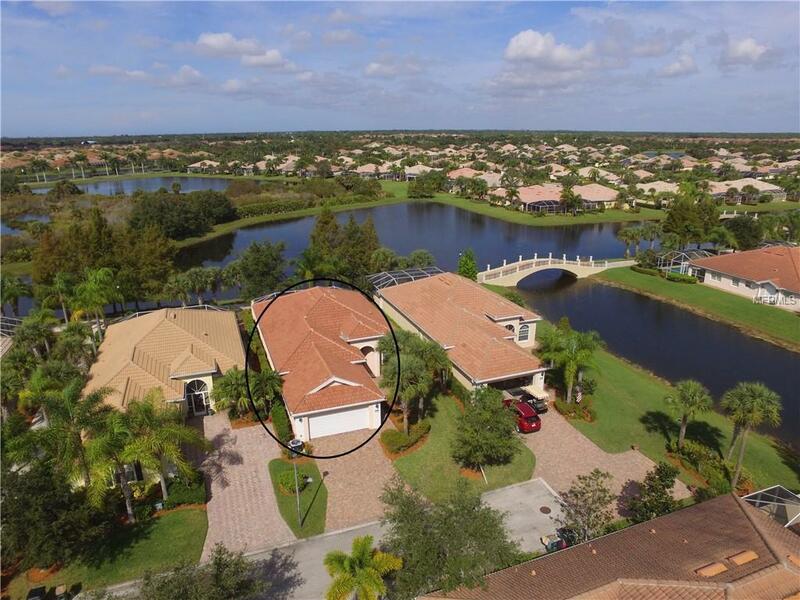 A grand home w/ awesome lake views in the beautiful community of Islandwalk. This 3 BR, 3 bath, plus DEN Oakmont Model features volume ceilings, upgraded porcelain tile throughout main living areas, solid surface countertops, raised white panel cabinets, central vacuum system, security system, and plantation shutters galore. His and hers baths and 3 organizer closets are the highlight of the master suite. This very light and bright home has an open floor plan, volume ceilings, & awesome lake views through multiple sliding glass doors, and a large extended lanai with an extended cage, all the makings for easy living & entertaining. All appliances, including washer & dryer, stay! New A/C (2016), New hot water tank (2016), new refrigerator (2016). Brick paver driveway & walkway. The impressive community resort centers calendar is full of fun activities so you will never get bored. Features include a lifestyle manager, full-time activities director, a gorgeous geothermal heated infinity edge salt-water community pool, a lap pool, state-of-the-art fitness center & personal trainer, massage therapist, movement room, 8 Har-Tru tennis courts, 4 pickle ball courts, library, banquet room, craft room, bocce ball courts, hot tub, and an open ballroom facility with a billiards room and outdoor fire pit for your evening enjoyment. There are endless water views and miles of paved walking/bike paths & venetian bridges throughout this spectacular resort community. For your peace of mind, there is a 24-hour guarded gate. Listing provided courtesy of Hoover Realty Llc.